A veggie version of a restaurant copycat recipe, these sweet and spicy Asian-inspired bites are an addictive appetizer or vegetable side dish. Bang Bang Cauliflower Bites are a healthy appetizer based on a restaurant copycat recipe, only this version is made with veggies. Some variation on Bang Bang Shrimp appears on the menu of several popular chain restaurants, and now I’ve cauli-fied it! This Asian-inspired dish has crispy coated baked cauliflower wings covered in a sweet and spicy sauce. This bang bang sauce recipe is even made lighter with Greek yogurt. 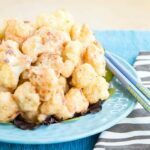 These baked cauliflower bites make a yummy side dish and are perfect to serve as healthy gluten free appetizers, too! Crisp-tender florets are coated in a light rice flour batter and baked, making them lighter than their crustacean counterparts and also gluten free. After they get golden and a bit toasted in spots, they are tossed in a creamy, slightly sweet, subtly spicy sauce. The bang bang sauce recipe was lightened up by subbing Greek yogurt for the usual mayonnaise, though I kept a bit of mayo in order to maintain the velvety texture and tone down a bit of the tang of the yogurt. Ah, copycats. With two little boys, I certainly know all about that. Even at two years old, Little Dude already wants to be just like his big brother. The Bug just earned his gold belt in karate, and all during the belt tests, you could hear Little Dude in the background screaming “Ai-yah!” He already can almost count to ten in Korean, and even instructed his Nana to stand at attention. I’ve found him getting more adventurous than The Bug at a younger age, wanting to go down the big slide at the park, and climb up and jump off of those playground pieces that indicate that they are for kids ages 6 to 12. But don’t you dare try to convince him that he might be better off in the toddler section. He asks to take showers, insists on brushing his own teeth, and yes, is even about ninety percent potty trained, all of which I owe to the example and encouragement of his older brother. It goes in the reverse direction too, but unfortunately with not as desirable outcomes. As much as we try not to indulge the crying and whining, Little Dude is two. Sometimes that’s the only way he knows how to communicate his needs, and sometimes we’ve just had enough and when the crying and whining start, we just give him what he is whining and crying for. The Bug, who is the most perceptive five year old you will ever meet, recognizes what we are doing, and will mimic these toddler antics in order to get his way. Little Dude will sometimes do things that are funny when a two year old does them, but then The Bug will copy, usually in a more obnoxious five year old boy manner, and then, much to The Bug’s frustration, it’s no longer funny. So he’s trying to be a copycat, but not really. Kind of like these Bang Bang cauliflower bites! The Bang Bang Sauce recipe uses Sweet Chili Sauce, which is typically found with the Thai ingredients in your local grocery store. 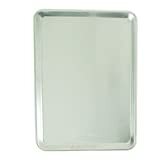 It is sweet with a hint of spice, versus a spicy chili pepper sauce. 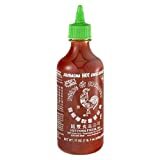 The heat comes from the sriracha sauce, and you can adjust the amount you add to your preference. You can cut the cauliflower into the size florets you prefer. The larger ones will take longer to cook and stay a bit firmer, and small ones soften up but then get nice and crispy if you leave them in long enough. This recipe uses brown rice flour and almond milk for the coating. 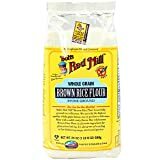 There are similar cauliflower wings recipes that use all purpose flour and regular milk. I have not done this myself, but it should work. You’ll bake the cauliflower bites until they are nearly done, then flip them over and put them back in the oven so they have the chance to get browned and crispy on all sides. You will probably have more Bang Bang sauce than you need for coating the cauliflower, as it might make it too soggy. Use just enough to coat and save the rest for dipping. Want some more spicy cauliflower recipes? 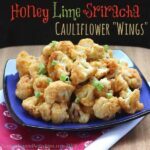 Honey Lime Sriracha Cauliflower Wings are another sweet and spicy cauliflower bites recipe. 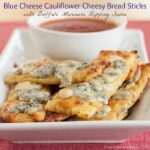 Blue Cheese Cauliflower Cheesy Bread Sticks with Buffalo Marinara are tangy and cheesy and get their kick from the spicy sauce. 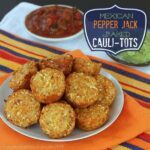 Mexican Pepper Jack Cauli-Tots give some Tex Mex flair to your tots. Parmesan Cajun Spiced Cauliflower Steaks from Nutmeg Nanny swaps your steak for veggies. Indian Spiced Cauliflower Rice from The Food Charlatan is a flavorful low carb side dish. Simply Spicy Fried Cauliflower from Give Recipe has a crispy and gluten free coating. 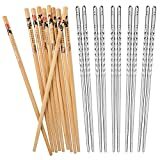 What do you need to make Bang Bang Cauliflower Bites? A must-make gluten free appetizer recipe that need to appear at your next party, or as a side dish on your dinner table. This is one of those recipes where I just can’t stop myself from finishing my serving and then after everyone else in the family had had their fill, I go back to the bowl and take whatever is left. So it may not be an exact copycat, but you all know that I am a bit cauli-obsessed, given my love of cauli-tots, cauliflower rice, and even just basic roasted cauliflower! Clearly it had to be done! Stir together the ingredients for the Bang Bang Sauce in a bowl and set aside. Whisk together the remaining ingredients in a bowl. Bake for 20 minutes, or until slightly less done than you want them. Remove from the oven and gently flip the cauliflower. Return to the oven for another 5-10 minutes, or until golden brown and tender. Transfer the cauliflower to a bowl, pour over the Bang Bang Sauce (you can reserve some for dipping, if desired), and gently toss to coat. First published on Jul 26, 2015. Sounds like a must try and I love how you lightened the sauce up also! I also know all about “almost” copy cat kids. I have some fond memories myself of my youngest having to “imitate” his brother. Thanks for bringing back those memories! Yum! I do not make cauliflower enough! Brianne, these bang bang cauliflower bites looks awesome. I’ve been having veggies the past few weeks and this gets me very excited. Yum! This sounds great and the sauce~amazing! Can’t wait to try these! I’m a little cauli-obsessed too and I love this #copycat version! YUM! It was good to see you last weekend! Thanks for sharing a little bit about your kiddos. And a glimpse into my future as a mom of two boys (although mine will only be 16mo apart)! Bang Bang Shrimp is my absolute favorite thing on Bonefish Grill’s menu, I’ve not tried it at other locations, but I do know it’s not limited to Bonefish. I would be willing to try your version with cauliflower, though! I love hearing about your boys! And I love this bang bang cauliflower—especially since Nick is home from college for the summer and he’s allergic to shrimp. It sounds amazing!